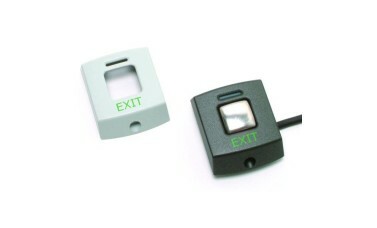 Paxton Exit buttons may be used with Compact, Switch2 or Net2 systems. They are supplied with a choice of black or white fascias which can be fitted in the final stages of installation. About- Exit buttons may be used with Compact, Switch2 or Net2 systems. They are designed to match our range of PROXIMITY readers and keypads. The exit buttons are supplied with a choice of black or white fascias which can be fitted in the final stages of installation. The exit buttons are available in three sizes as shown in the illustration below. Operation - The green LED is lit continuously. When the exit button is pressed, the green LED flashes to indicate that the door is unlocked (only when used with Switch2 and Net2).